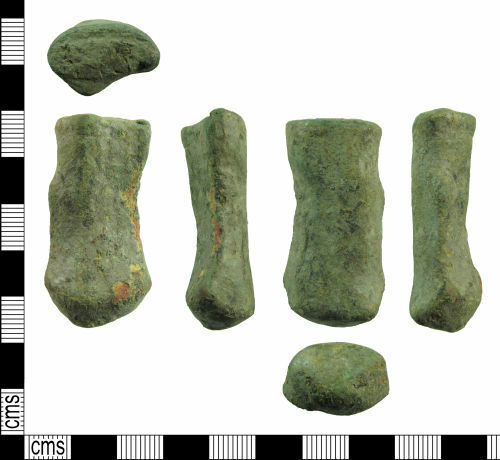 A Medieval to Late Post-Medieval (1200-1800) copper alloy leg with rounded foot from a cooking vessel. It measures 41.61x21.05x13.77mm and weighs 45.70g. At the (old) break the triangular-sectioned mid-rib is visible very off-centre. Otherwise the break at this point is D-shaped, being rounded to the reverse. The break measures 19.15x12.25mm. Below the leg narrows and widens again at the rounded foot, which measures 21.05x13.77mm. By this point the mid-rib is barely visible. The metal has a silvery sheen and traces of a black substance.